The Hama PhotoPlayer 1080i allows you to easily view photos on a Full HD television. It retrieves data using an integrated 35-in-1 card reader or through the USB port and connects to an LCD, plasma device or a projector through the component output. 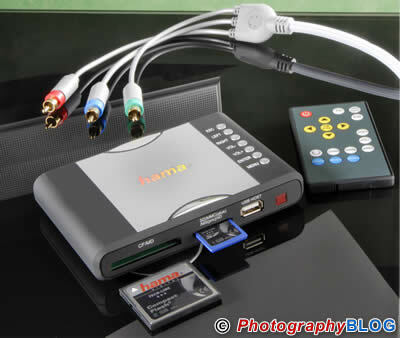 The Hama PhotoPlayer 1080i also boasts slide show function, rotation mode, zoom mode, and background music. Price and availability of the Hama PhotoPlayer 1080i to be confirmed. There is, undoubtedly, something charming about slide show evenings: the atmosphere created by reminiscing about the past while comfortably surrounded by good friends or family. In the age of digital pictures, you can easily view photos on the television, but there will always be a considerable reduction in quality due to the video input. Having several people crowd around a computer screen is not quite the best alternative either. Hama has a compelling solution: the new PhotoPlayer 1080i. This small box is easily connected to your television or projector. It retrieves data using an integrated 35-in-1 card reader or through the USB port, which can be directly connected to a camera, USB stick, MP3 player, or even a hard drive. The PhotoPlayer produces outstanding, pin-sharp pictures in Full HD, even from 3-megapixel cameras. Especially of interest to those who own an LCD or plasma device or a projector is that the PhotoPlayer transmits digital pictures through the component output. For connection to regular televisions, the PhotoPlayer is equipped with a 3.5 mm jack socket for PAL output. The PhotoPlayer also boasts slide show function, rotation mode, zoom mode, and background music, which can all be operated using the remote (included). Moreover, the Player functions as an external USB 2.0 card reader when connected to the computer. Included in the PhotoPlayer 1080i package are a power supply unit, an infrared remote control, USB connection cable, A/V cable, and a high quality component cable.